8x8 and Zendesk Integration | 8x8, Inc. The expectations of the customer are changing. The expectations of the customer are changing. They’re being shaped by every interaction they have both online and offline – while shopping, gaming, traveling, even at work. They demand service that is instant, personalized, transparent & ubiquitous. And ready or not, you have to live up to the demands of this customer or your business will suffer. The good news, you’re already one step ahead of the game. By using cloud applications, like 8x8 and Zendesk, your company is able to be more agile and innovative – and it’s about to pay off. 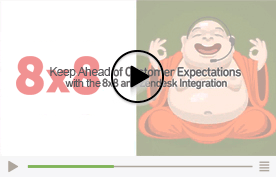 8x8 and Zendesk have teamed up to create an out of the box integration that creates a seamless solution that can help you transform your customer service, customer sales and internal help desk operations. Empowering every employee in your organization to provide a superior customer experience.